If you're an avid reader of this site, odds are you're receiving something for Christmas or Hanukkah this year that taps right into that movie love. Movies can be a very personal thing, of course, but when your friends and family get wind of a movie or TV show that you're a particular fan of, it makes it infinitely easier for them to get you a present based around that. People who were big Lost fans six years ago are probably still learning that the hard way. We've already brought you a lot of good ideas for pop culture gifts with our series of gift guides, but now we're getting a little nostalgic for our own holidays gone by, remembering the best gifts we ever gave or received that proved what a major role pop culture can play in our lives. Put on your Harry Potter scarf and join us as we revisit our best pop culture Christmases past. Years ago, my boyfriend (at the time) had been trying to convince me to watch Buffy the Vampire Slayer, insisting that I would love it. I was sure I wasn't interested. I remembered having seen the pilot years prior, back when it first premiered, and it just hadn't caught my interest. Jump to Christmas of 2004, more than a year after Buffy's final season aired. I bought my boyfriend the first season on DVD, making no promises that I'd watch it with him. In fact, the only promise I remember making that Christmas was to marry him, which I eventually did. But some time before we tied the knot, I also ended up watching Buffy with him, starting with that first season on DVD. I soon learned that the show was smart, funny and dramatic, and by Season 2, I was completely hooked. Buffy wasn't the first great show my husband convinced me to watch and it probably won't be the last. Sometimes it just takes me a little while to buy the hype. I said the same about Battlestar Galactica, which he also talked me into watching, and I anticipate saying something similar about Doctor Who if and when I finally get around to watching that series. And I like to think I've sold him on a few amazing TV shows and movies through the years. That's part of the dynamic of the relationship when one geek marries another, I suppose. I thought I was buying him a present when I got him that first season of Buffy on DVD, but in the end, we both got something out of it. I also got a ring that year, so it was a really good Christmas. My parents aren’t movie people. Their Christmas gifts were practical choices for a normal kid: A bicycle and a baseball glove one year, a skateboard and a pile of new books the next. But I always asked for movie-related gifts … without even really knowing the importance of their pop-culture value. Rarely did I find a gift of that ilk under the tree. Except one memorable year, when I tore open the wrapping on a Millennium Falcon. Now, the odds were in my favor. It was 1980. Empire Strikes Back made Star Wars unavoidable. It’s likely my parents stumbled into the neighborhood Toys ‘R’ Us and grabbed the first item off of the shelves. 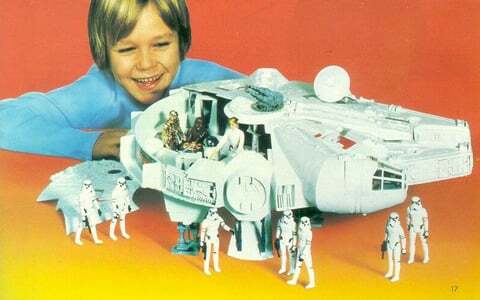 Back then, they would have a 9-in-10 chance of dropping a Star Wars toy in the cart. But I viewed it as something different at the time, and I still think of it in this way today: The Millennium Falcon was the first movie-related gift given to my by my parents because they finally realized that they were raising a die-hard movie fanatic. It was the first in a longer line of movie-related presents that continue to this day. And the Falcon remains a gift that keeps on giving, as my sons play with it to this day. Merry Christmas, boys, and thanks, mom and dad. Some number of years ago, I went on a few dates with a random girl I met in college. Christmas was rapidly approaching, and as anyone who has been in that situation knows, it’s awkward to exchange gifts with someone you’re casually dating. You want to show you care; yet, you don’t want to seem like you care too much. Looking back, I haven’t the slightest idea what I bought her. I’m sure it was an ugly scarf or dinner at a nice, forgettable restaurant, but I will never forget what she brought me. 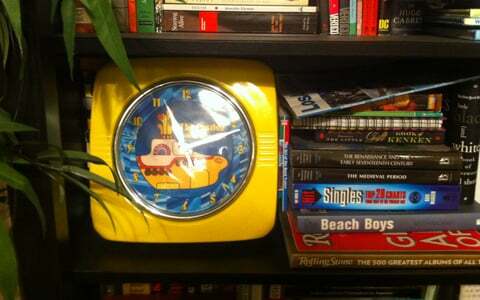 Bright as the sun and intentionally ugly in a retro, mesmerizing way, she gave me a Yellow Submarine clock. It was almost like she was testing me. We hadn’t talked about the Beatles or even the coolness of funky clocks. It was like she was just throwing it out there, saying, “This is awesome, and if you’re awesome, you’ll think so too.” Luckily, I did. Today, that clock sits in our living room. It’s still one of the coolest things I own, and it’s one of many small reasons why that random girl later became my wife. Over the years, my parents have fostered my love of movies with plenty of VHS tapes, DVDs, and Blu-rays each Christmas. 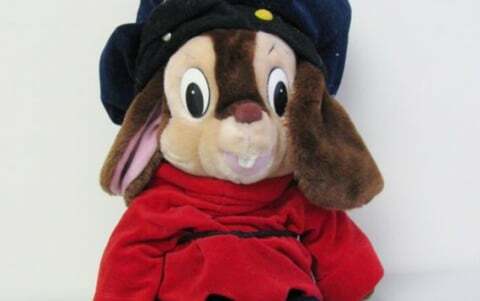 While I can vividly recall the joy of unwrapping particularly hard-to-find titles, the movie-related gift that filled me with the most excitement was undoubtedly the plush doll of An American Tail's Fievel Mousekewitz I received in the Christmas of 1986. The movie opened just a month before. I was fascinated by the story of a little mouse who escaped the oppressive cats of Russia, crossed the terrible and tempestuous sea, and made it to America, where the streets were not in fact paved with cheese, but where he found plenty of adventure and devoted friends. I still love this movie, but at four years old, I was absolutely enthralled by it. My parents had opted to get me the 22" plush, meaning the giftwrapped doll was enticingly large. I remember the feel of it as I prodded its wrapping trying to divine its contents, the give of its packaging—definitely a toy! I was four years old, and a small-for-my-age four at that, so when I pulled back the wrapping, I was thrilled to see a doll that seemed as big as me! He looked just like the Fievel from the movie, aside from being exponentially larger. While many years have passed since that Christmas, I can still recall the soft fur and velvety texture of his clothes I felt upon my first of many Fievel hugs. I credit a lot of my love for movies to my dad. He's not a movie critic or anything, and is rarely willing to sit down and watch something at home for longer than 30 minutes-- I've learned that the hard way after trying to give him DVDs for several Christmases. But my dad loves going to the movies, and he loves revisiting the old movies he loves… and even now I'm a professional movie critic, there are still sometimes movies he adores that he knows I need to catch up on. 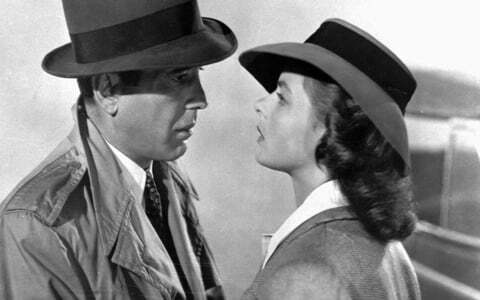 Back when I was in college, that movie was a big one: Casablanca. I'd somehow made it halfway through freshman year of college without seeing the Humphrey Bogart classic, and when my dad gave it to me on DVD that Christmas, I welcomed the chance to catch it. I did; I loved it; I loved it again when I watched it later that year in film class. And then the next Christmas, when my dad gave me Casablanca on DVD again, I probably would have loved it again-- except I had to fess up and remind me he'd pulled the same move the year before. What can I say? He wants me to know my stuff. What better sign of cinematic love is there than that?